Jackson Kemper was born in 1789 in upstate New York. His father served under General George Washington in the Continental Army, and his mother was from well-known Dutch families. He was baptized at Trinity Church, Wall Street. He was class valedictorian at Columbia College and then studied theology under Bishop Benjamin Moore and the Rev. John Henry Hobart. He was ordained a deacon at age 21 in 1812 and priest two years later, by Bishop William White of Pennsylvania. He was sent on missionary tours of western Pennsylvania, Virginia and eastern Ohio, which was the start of his illustrious ministry as a missionary. In the early 1800s, the Episcopal Church was beginning to consider its responsibilities for mission in the newly developing, and expanding, United States. In 1820 the Domestic and Foreign Missionary Society was constituted by the Episcopal Church. Jackson Kemper was one of the original patrons of the society and traveled widely to visit and evaluate missionary efforts. In 1835 the General Convention of the Episcopal Church decided to appoint bishops to direct the Church's future missionary work in the expanding west. Kemper was elected unanimously as the first missionary bishop in the Episcopal Church, with responsibility for what now are the states of Indiana and Missouri. His jurisdiction eventually included what are now the states of Indiana, Missouri, Wisconsin, Kansas, Nebraska, Iowa and Minnesota. His immediate concern was “inventing” a new model of episcopacy, one that had never been practiced by an Anglican bishop anywhere before. There were few, if any, precedents on which to depend or look to for guidance. Bishop Kemper’s life as a missionary is almost inconceivable to us today. He traveled from the shores of Lake Superior to the Gulf of Mexico by steamboat, on horseback, by stagecoach, and often on foot. He slept in the open or on the hard floor of a remote hunter’s cabin or in an Indian wigwam. In one instance, he traveled for four days in order to confirm a young person in northern Wisconsin. Bishop Kemper traveled by water whenever possible, but he often had to resort to stagecoach or horseback. He carried all his possessions in his saddlebags: vestments, bible, prayer book, chalice and paten, and personal items. He organized six dioceses, consecrated nearly a hundred churches, ordained more than two hundred priests and deacons, and confirmed almost 10,000 souls. He lobbied, unsuccessfully, in the East for a German translation of the Book of Common Prayer to use in his ministry to German immigrants. Pleased with the establishment of a Winnebago mission at Oneida in Wisconsin, he pressed for further work with Native Americans. 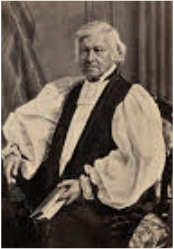 Bishop Kemper later confirmed five people of the Ojibwe nation, among them John Anmegahbowk Johnson, now commemorated on June 12 in the Episcopal Church's liturgical calendar as Enmegahbowh, the first Native American Episcopal priest. He also founded Nashotah House, one of the Episcopal Church’s residential seminaries, in Wisconsin. In 1847 he was elected to be first Bishop of the new Diocese of Wisconsin, but he declined. Later, in 1859, after Kemper had retired from missionary work, he was immediately elected for the second time to the Diocese of Wisconsin, and this time he accepted, remaining in that office until his death on May 24, 1870.